Easy to install, with installation being cited as both quick and simple. It’s also particularly stylish, with a well-constructed and attractive exterior. Gives off dim light, even when lighting is on the highest setting. Additionally, design issues could make using the fan properly a bit confusing. Quiet and well-functioning fan. Continues the quality for which the Hunter line is known. 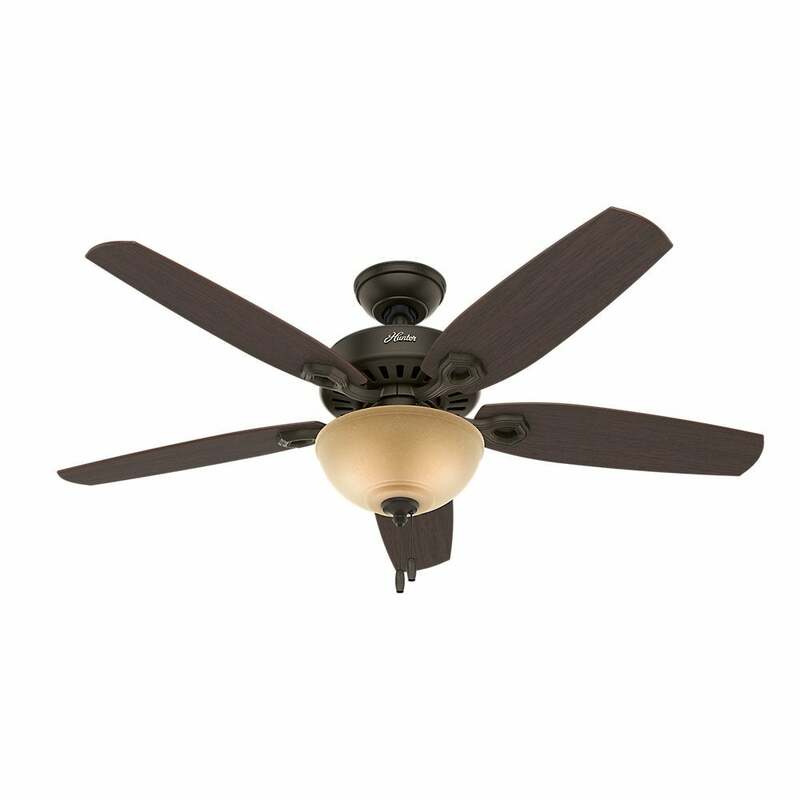 An attractive fan, with many reviewers taking the time to comment upon its appearance and solid construction. A quiet, easy-to-use fan that is particularly well-suited to smaller rooms. Fan’s speeds don’t seem as powerful as expected, with the “high” setting feeling more like a “medium”. The dim light given off by the fan, even with replacement bulbs, is another issue noted by many. A large, quiet fan that works well and provides plenty of air flow. 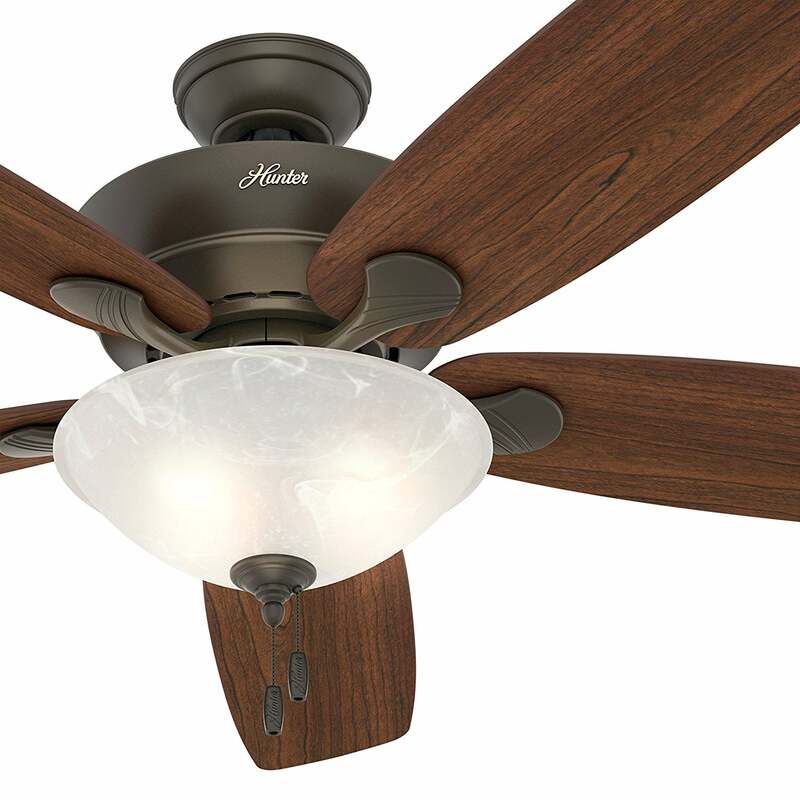 Moving air is no problem with Hunter’s 60” Great Room Ceiling Fan. 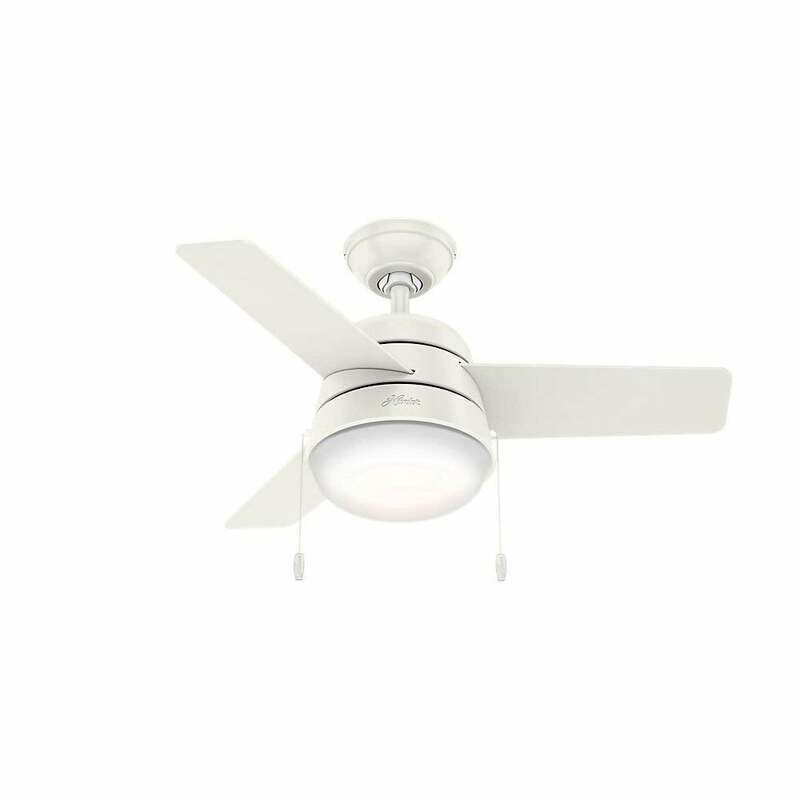 Reviewers noted that it’s a large, quiet fan that moves plenty of air and boasts light bright enough to fill a medium room. It seems that the fan doesn’t always come with all of the screws necessary to install it, specifically the globe. It can also be a bit difficult to balance the fan after installation to ensure there is no wobble while it is running. 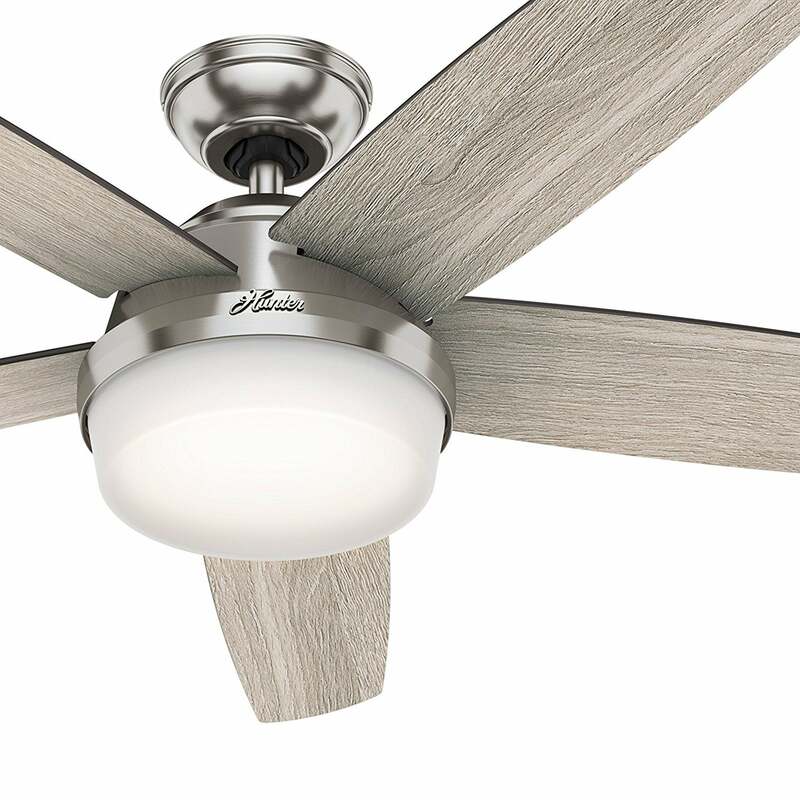 A neutral fan that fits in all décor, Hunter’s Brushed Nickel Ceiling Fan offers great performance but a tricky installation. 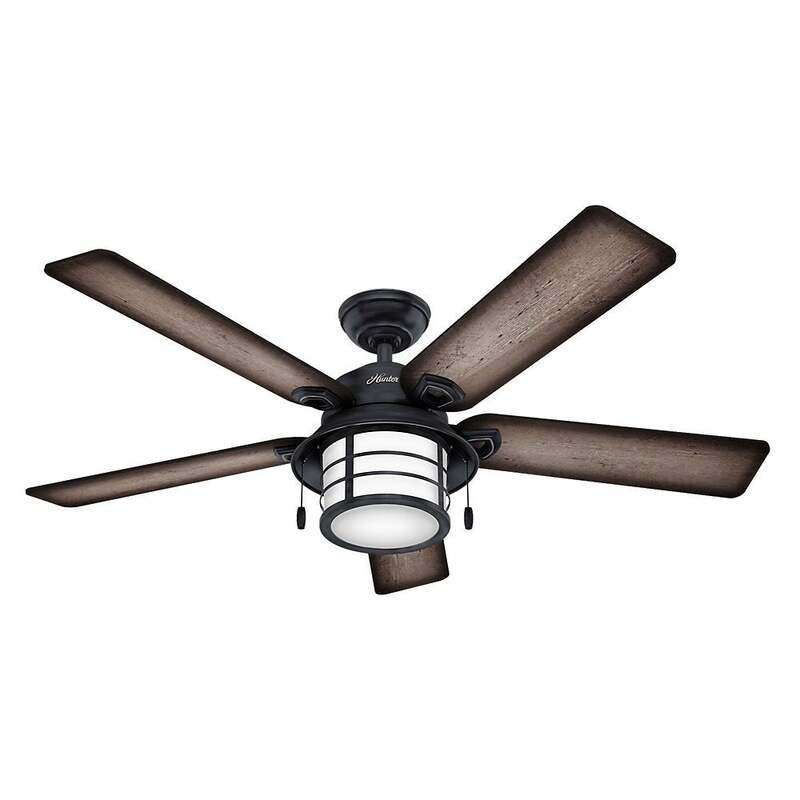 This fan is a particularly attractive one, boasting solid construction and brushed nickel accents. It works well once installed, too, with the globe working nicely and the fan producing plenty of air flow. This can be a tricky fan to install, with sparse instructions and lots of small pieces to put together. The fan is controlled via remote, not pull chains, which means that losing the remote could render the fan temporarily inoperable. A sleek fan that offers an attractive appearance but lackluster output. The fan looks good, with a sleek and minimalist design, and runs quietly. A ceiling fan can be the centerpiece to your room, working to provide utility while boosting the overall look of the area. It can also make hot days less miserable, with the best fans providing cooling air flow quietly and consistently. Your comfort is at stake, in other words, which is why it’s important to find the right fan for your needs. Working your way through thousands of online reviews probably isn’t your idea of a good time. In fact, it’s highly likely that you have far better ways to spend your time. That’s where our team of review specialists comes in! We carefully reviewed five of the best Hunter fans on the market so that you can make the best choice possible. Stagnant air can be a serious annoyance. It makes sense, then, that the ceiling fan is a particularly popular buy for individuals in all manner of climates. With a ceiling fan, you can transform your home from hot and humid to cool and refreshing. One thing that many buyers worry about when considering a ceiling fan is the amount of space it will take up. You take the time to carefully decorate and design our home after all, so the thought of a large contraption ruining its design can be a distressing one. One of the great things we discovered while researching the best ceiling fan options on the market, however, is that there is a style to suit any need. Whether you are looking for a low-profile, sleek design or one a bit bolder and unapologetic in its appearance, we have found some great options for you to consider. You won’t necessarily have to sacrifice form for function either, with some of the most attractive offerings also providing quiet, powerful air movement. One of the most important factors to consider when looking at the best ceiling fan for your needs is the design in question – although perhaps not for the reason you might suspect. While many buyers might steer clear of a two or three-bladed fan due to concerns of low air movement, we’ve found that even designs featuring few blades can prove quite powerful. Instead, keep your eye on the fan’s distance from the ceiling, the location of its direction switch, and the ease of replacing light bulbs. Some of the fans we reviewed look incredible and move air well, but they were plagued by unfortunate design choices. A fan that has its direction switch and lights underneath a globe that must be carefully unscrewed to access, for example, might not be the best choice if you aren’t comfortable spending time on ladders. This is especially true of the direction switch, which is often changed several times throughout the year. The fan’s distance from the ceiling is another factor that can significantly impact usefulness. Some fans are mounted a bit too close to the ceiling, which inhibits air flow and makes it harder for you to actually feel any movement. Others are mounted excessively far from the ceiling, allowing them to hang down anywhere from four to six inches. While this might not be an issue in rooms with high ceilings, it can be a deal breaker in smaller rooms whose ceilings place the fan dangerously close to heads and faces. Location is important when it comes to ceiling fans and airflow. With that in mind, try to place your fan in the center of the room with plenty of clearance on all sides. This allows the fan to move plenty of air without obstacles. Fans that are too close to walls or other ceiling fixtures can experience impeded air flow and result in lackluster air movement. Ideally, your fan will be the only thing in the middle of the ceiling and will have several feet of empty space surrounding it. Keep in mind that you can use your fan in both winter and summer! In the summertime, you want your fan to spin counterclockwise so that hot air is drawn up and cool air is what circulates through the room. In the winter, on the other hand, you want your fan blades to move clockwise. This draws the cold air up and the warm air down. Doing this can actually help save you money on your energy bill while keeping you more comfortable even in extreme temperatures. Make sure that you know if your fan can switch blade direction and don’t forget to change it (usually via a switch on the base of the fan) when the seasons turn. How many ceiling blades fans are best? There is no “best” number of blades for ceiling fans. We have seen that two-bladed fans can work just as well as five-bladed fans, for example, and some of them can even operate more quietly than more traditional fans, too. With that said, if you’re looking for a simple, uncomplicated fan that is dependable in its air movement ability, you might want to look at fans with five or more blades. This tried-and-true design has proven itself to be a reliable option. Do ceiling fans really work? Ceiling fans work to circulate air throughout the room in which they are installed. This can help keep a room cool as well as warm – it all depends on the direction of the blades (which is typically adjustable via a switch located on the fan). They are only as effective as their design, however, which is why it’s so important to make the right choice when selecting your next ceiling fan. Is Hunter a good ceiling fan brand? Hunter is a well-respected manufacturer that has been in the industry for over 130 years. While that certainly doesn’t mean that every fan they create is flawless, it does make them a brand to watch if you’re looking for someone who tends to have quality offerings. A good tower fan can be a compliment to a home’s existing A/C unit to help ensure that air is the right flow, speed, and comfort-level for your needs. Let us help you select the best one for your home.